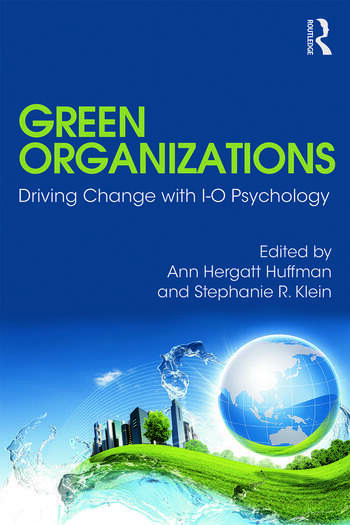 This book is a landmark in showing how industrial-organizational psychology and related fields contribute to environmental sustainability in organizations. Industrial-organizational psychology embraces a scientist/practitioner model: evidence-based best practice to solve real-world issues. The contributors to this book are experts in science and practice, demonstrating the ways in which human-organization interactions can drive change to produce environmentally beneficial outcomes. Overall, the authors address cogent issues and provide specific examples of how industrial-organizational psychology can guide interventions that support and maintain environmentally sound practices in organizations. Green Organizations can be used as a general reference for researchers, in courses on sustainable business, corporate social responsibility, ethical management practices and social entrepreneurship. The book will provide an excellent overview for anyone interested in sustainability in organizations, and will serve as a valuable guide to industrial-organizational psychology and management professionals. Ann Hergatt Huffman is Associate Professor of Psychology and Management at Northern Arizona University. Dr. Huffman received her Ph.D. in Industrial-Organizational Psychology from Texas A&M University in 2004. Prior to Texas A&M University, she worked as a principal investigator with the Walter Reed Army Research Institute-Europe. She was awarded the 2009 Northern Arizona University Most Promising New Scholar Award and was selected as a 2007–2008 Sloan Early Career Work-Family Scholar. Stephanie R. Klein is the Solution Specialist at SHL in Minneapolis, where she has held a variety of roles including change management, product development, assessment and training program development, and client solutions consulting. Most recently, she led post-merger transformational change within the UK and Ireland sales organization. Her areas of professional expertise include transformational change and the ability to balance client logistics, scientific best practices, and technology capabilities to identify solutions to client business needs. Dr. Klein received her M.S. and Ph.D. in Industrial-Organizational Psychology from the Pennsylvania State University in 1998 and 2006, respectively, following her B.A. in Psychology from Kenyon College.